Fabric Scissors – Sharp scissors designed for cutting fabric. Do NOT use them on other materials. Paper Scissors – Regular scissors for cutting stencils. You can use them to cut fabric, but not as easily as you could with fabric scissors. A White Fabric Pencil – You can find these at any craft store. Use them to mark your shirts. The marks will wash out. Let’s start with the basics. For most of these mods, you will want to cut off the hemmed edges from the collar, bottom, and sleeves. This will cause some natural rolling, but that’s okay. Collar – For an off-the-shoulder look, you will want to cut the collar to be wide, but also shallow. Too deep, and the whole thing will fall right off your chest. I usually start by making cuts 2-3 inches from the collar. If it’s too narrow, you can easily cut more from the side. You can’t make the shirt more narrow once you cut, so better to test it with room to make it wider. Sides – Next, we’re going to modify the sides to make the shirt more form fitting. Put the shirt on inside out and make a mark where you want the top of your ties to be. You can use a white pencil for this or a safety pin. Lay the shirt flat on a table. Starting at your mark, cut horizontal lines running down the side of the shirt, 1-2 inches apart (depending on how thick you want the bands to look). You can vary the depth of the cut depending on how much you want to tighten the shirt. The tighter you want it, the deeper you cut. I suggest cutting at least 2 inches (which will leave a 4 inch slit) so you have enough fabric to work with. Snip each strip vertically in half. It will look like fringe. Gently pull each strand to stretch it out a bit. Tie the strips back together (while still inside-out), leaving tails on the knots. You can even tie multiple strips together for a different look. If desired, cut off the excess tails. Determine where your window of strips will be. Length and width are completely up to you. Mark this with your white pencil. Fold your shirt to divide the back symmetrically. Cut 1/2 to 1 inch slits horizontally down your determined length. You can make a straight rectangle or create just about any shape you like. You can even make curved lines. Gently pull each strip to stretch it out. Ladder method: Pull the second strip from the top behind and over the top string. Pull the third string up and over the second the same way. Continue all the way down. Cut the last strip in half and tie it together to secure. Twist method: Use the method above, but twist the working strip before moving down. Check out Salina Siu’s instructional video for a great visual aid. 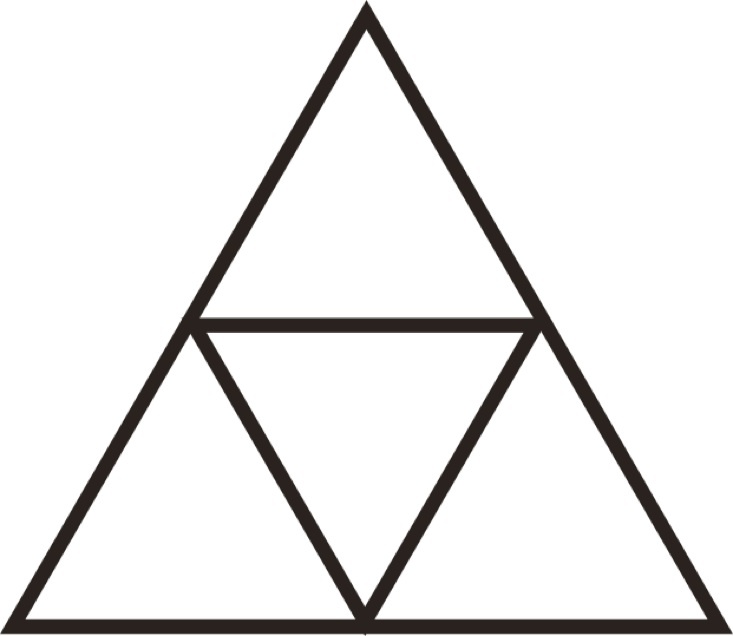 Print a large outline of the Triforce. I used this one and resized it bigger using Photoshop. Using paper scissors (not your fabric scissors), remove the insides of the three outer triangles. Now you have your stencil. Tape down the stencil to where you want it to sit on your shirt. I recommend the upper back. Be sure to consider where your bra may show though (though you can easily wear another tank top under the shirt for a nice color contrast). Draw along the edges of the cut-out triangles with your fabric pencil. Using your fabric scissors now, cut out the three triangles slightly inside the lines in order to keep the inner triangle connected. Be extremely careful not to cut outside of your lines. You should have several thin lines holding up the inner triangle. If you cut through them, you’re boned. Shredding can be either extremely frustrating or totally zen. Get comfy on your couch and get ready to marathon your favorite show because shredding is a very slow process. Cut off the entire bottom hem and sleeve hems. Decide how wide you want your shredding to be at the bottom. I find that shredding will naturally want to taper as you work. Turn the shirt upside down, and beginning from the cut edge, start to pick at the edges, pulling the threads upward. Eventually, the fibers will start to unravel with a gentle pull. Don’t pull too hard or else your threads can break (unless you like the ripped look). For a visual reference and more in-depth instructions, check out The Fashion Citizen’s tutorial. Optional – You can cut extra holes in the shirt and do this process, however, you must always work vertically. Fringe is a great way to create a cutoff look without actually bearing too much of your midriff. With your fabric pencil, mark each side of the shirt at the highest point where you want your fringe to start. Connect the two points either with a straight line or a slight V using your fabric pencil. Cut 1/2 inch fringe all the way around the bottom, stopping at the line each time. Gently stretch each strand and tie the bottom in a tight knot.